The story takes place in the small town of Cypress Creek where 12-year-old Charlie Laird, his Father, and his annoying little brother, Jack lives. They live in a purple mansion on DeChant Hill with their new step-mother Charlotte. Ever since moving into the mansion, Charlie has been having horrible nightmares. They sometimes seem so real that he does not want to go back to sleep in fear of another nightmare. Ever since Charlie moved into his step-mother's home he has felt uneasy and just not right. Unhappy in more ways the one, Charlie begins to see odd things happening around the house and his nightmares are getting so bad now he doesn't sleep at all. In these nightmares, he often sees an evil witch who looks an awfully like his new step-mom. Exhausted and angry, Charlie begins picking fights with Jack and sometimes wishes he would just disapear. These dreams that plague him are becoming more and more real, until one night Charlie awakens to see the evil-charlotte-looking witch coming into the real world and steal Jack away....to the place of which all of Charlie's nightmares roam. Now Charlie must enter the Neverworld and fight his way to find his little brother and bring him home before it's too late! Facing his fears may be the only way to succeed but when you're living in your own nightmare nothing is ever that simple. Will Charlie be able to save his brother from the witch before time runs out? Well...you'll have to read the book to find out. For a middle-grade book, it totally rocked! I mean I was so surprised but how much I truly enjoyed this story. Charlie was such a fun and interesting character. He would do anything to get his brother back, and I mean anything. All of the people, creatures, and monsters he meet along the way were so outstanding and I love how each of them played such a huge part in helping Charlie throughout the book. The world building was beautifully done, with such a spooky ambiance throughout. The story itself was so much fun to read and the experience of being there alongside Charlie while he faced his fears to save Jack was epic! I can't say enough great things about this book. I knew going into it that the plot sounded like something I would like but I never expected to love it as much as I did. Another fun thing that really made this book even better than it already is, are the illustrations that go along with the story, like the ones below. These beautifully draw images add so much to the book and really make the story come alive. I am so excited and looking forward to reading what happens next, especially since there was a cliffhanger at the end. I recommend Nightmares to all of my readers, young and old. 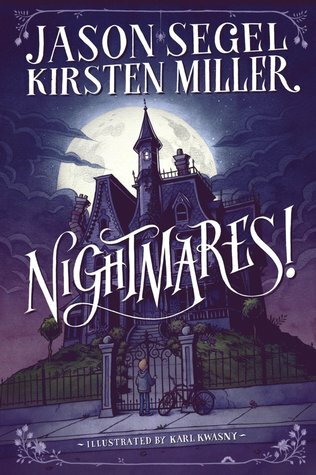 Props to Jason Segel & Kirsten Miller, you both did an amazing job writing this book. I can't wait to see what happens next!